This simple nightgown/nightdress for a doll uses scraps of fine lawn fabric and ribbon trim which is finished on both sides, to make a removable nightdress for even the smallest of dolls. The fabric needs to be gathered, so if possible look for scraps or small rectangles of cotton lawn from handkerchiefs. You can use ribbon or lace for the trim. For the easiest finishing, the ribbon trim should be double-sided (good on both sides) with a shaped edge if possible. Fine silk ribbons or lace will work for trim as well. This little dress is entirely hand sewn using a simple running stitch and a backstitch. The simple doll nightgown is cut from a folded piece of lightweight lawn fabric to give a front and back piece for a doll's nightgown/nightdress. Fold your fabric in half so the fold line runs up the side of the fabric. Lay the fabric over your doll and cut a doubled square of fabric which extends from the doll's neck to the doll's feet, and from roughly the wrist of the doll to the opposite wrist. With the two pieces of fabric laid on top of the doll, measure back to a bit further than the doll's elbow from the wrist. Trim the fabric from that point in a slanted line down to meet the bottom edge of the fabric. Remove the two fabric sections from above the doll and leaving the trimmed edges together, fold it in half along the bottom edges. Trim the opposite side of the fabric using the first trimmed triangle as a guide so the sleeve sides are evenly trimmed. To stitch your doll's nightgown together, lay the pieces so the "good" or "right" side of the fabric is facing the inside of the two fabric sections. Use a simple back stitch roughly 1/8 inch (2mm) from the edge of the sides of your nightdress to sew along the seam, taking care to keep your stitches in a straight line. Take the smallest stitches you can, to sew your nightgown securely. Take care not to pull your thread too tight. If your fabric frays, you can prep the edges with a thin coat of PVA (white) glue along the cut edge, or use a sewing product like fray check to hold the fabric edges. To prepare the trim for the bottom of the nightdress, take your ribbon and fold it in so the patterned edges lay above each other with the fold at the top. Stitch just inside of the folded edge using a running stitch to hold the trim layers in place temporarily until they are sewn to the bottom of the nightgown. Stitch a length of ribbon which is slightly more than you need to go around the entire bottom of your nightgown once you have the side seams sewn. Turn the doll's nightgown/nightdress right side out so your seams are on the inside. Turn up roughly 1/4 inch (6mm) of the fabric at the bottom of the nightdress and set the trim under the folded edge so the pattern of the trim lines up with the bottom edge of the nightdress (see photo). Set the start of the folded trim at the center back of the nightdress. Use small stitches to sew the trim in place along the bottom edge of the dress. Trim any excess fabric if necessary after you have sewn the trim completely around the bottom of the dress. Turn the nightgown/nightdress wrong side out (before you completely trim away any excess ribbon trim on the bottom of the nightgown) and stitch a small seam along the ribbon trim edges so they match neatly against the bottom of the nightgown. 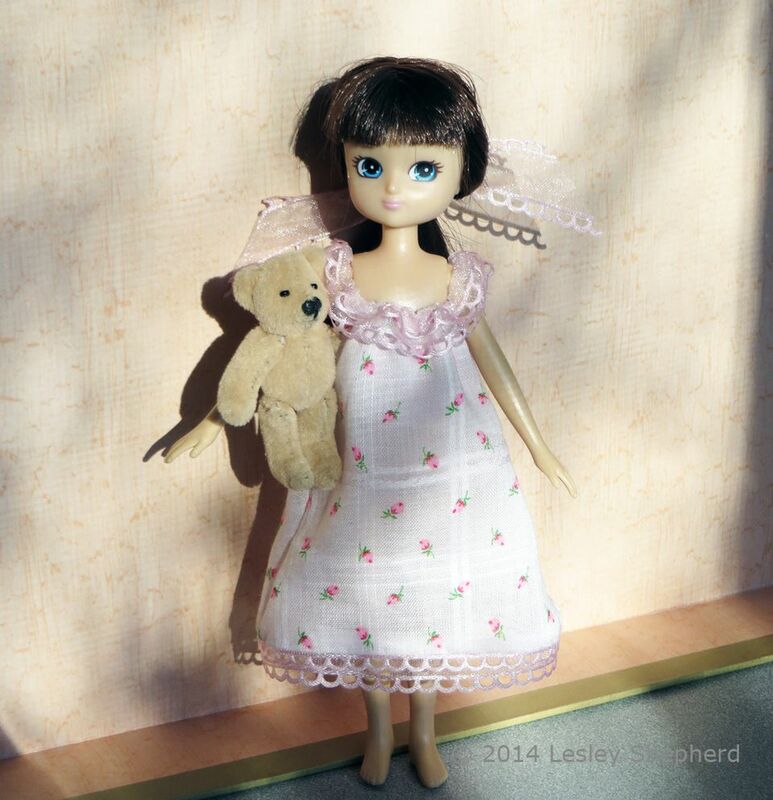 Once you have the trim sewn on the doll's nightgown, turn the nightgown right side out and fit it on your doll. Set the bottom of the nightgown where you want it to remain against the doll's legs. Fold down any excess material at the top of the nightgown so it fits neatly under the doll's arms. Gather the Top of the Doll's Nightgown. The top of the doll's nightgown/nightdress is shaped with small gathers made by stitching three rows of running stitch using fine elastic thread. Start by stitching the first row of running stitch roughly 1/8 inch (2mm) down from the folded underarm edge of the nightgown. Gather the thread once you have finished stitching entirely around the nightgown. Gather your thread up so you can still stretch the top of the nightgown to its full width when you stretch out the threads. Make a small knot to hold your elastic thread on the inside of your nightgown. Stitch two more rows of gathering with elastic thread just down from the first row. Knot the thread after you gather the elastic to hold it in place. The ribbon trim for the top of the doll's nightgown is made from a folded strip of trim the same way the bottom trim was folded to show off the edges. This time instead of sewing the trim with a running stitch to hold the fold, a running stitch of elastic thread is used to gather the ribbon trim into a ruffle for the top of the nightgown. To size the ribbon trim to fit your doll, take a piece of ribbon and wrap it around the doll's body under the arms twice. Fold this length of trim and stitch it using a knotted section of fine elastic thread, gathering the trim as you sew. When you get to the end of your length of trim, test to make sure your ruffle will stretch long enough to fit around the doll, plus leave enough stretch to cover the doll's arms. Stitch a fine seam across the cut edges of the trim, with the trim edges turned to the inside or 'wrong' side of the ruffle. Line the seam in your circle of gathered trim up with the center back of the doll's nightgown. Fold the ruffled trim in half before you start and take one or two stitches through the trim at the front center of the nightdress so your trim will be even on either side. Carefully set the trim onto the top of the nightgown and stitch a fine running stitch just down from the folded edge of the nightgown using fine elastic thread. This time you are sewing the trim onto the top of the nightgown, stretching out the gathers in the nightgown with your fingers as you carefully sewn the trim in place. Stitch from the back center of the nightgown to a point just back from where the armholes need to be for your doll. When you have stitched the trim across the back of the nightgown from the center, to where you want the sleeve cap to begin, gently push the ruffled trim out of the way and continue to stitch with your elastic thread across the armhole fabric edge across the armhole side seam, and out to a point on the front of the nightgown which is equal to the distance from the side seam to where you started the back trim stitching. Put your trim back onto the edge of the top of the nightgown and stitch across the front of the nightgown, removing the running stitches you used to mark the point where the trim should center on the front of the nightgown. Continue across the front of the gown to the point where you want to make the final armhole and finish that armhole the same way you did the first one. Stitch across from the back edge of the armhole joining the top of the trim to the top of the nightdress until you finish up at the center back. Securely knot your thread on the inside of your nightgown. To finish the nightgown/nightdress for your doll test fit the nightgown on the doll to make sure the sleeve openings are large enough for the doll's arms. If the armholes are too large, you can use a bit of elastic thread to gather the trim again over the arms to make the nightdress fit tighter. Add a small bow to the front center of the neck trim if you wish. To make more detailed nightgowns/nightdresses, consider combining different types of miniature trims, like bunka, or twisted cord made from embroidery thread to decorate your nightdress. Tiny seed beads can be sewn along trims or added as decoration to ribbon bow center as well. Here Comes the Clothespin Bride, Ready for a Cake, Decoration, or Toy.